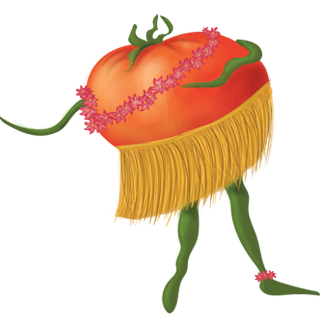 Come meet the characters who grace our walls at Dancing Tomato Caffé (some have even come to life as mascots). Artfully designed by a family friend and painted on to the walls at the caffé, our dancing tomato friends, Mari Nara, Fabulous Fabio, Disco D’Angelo, and the Three Stewed Tomatoes—among others, grace the walls and gladden the hearts of DTC guests. 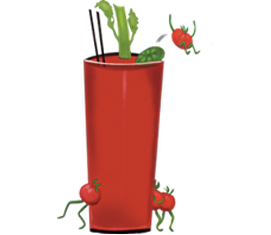 Our cheery mascot, Cherry Tomato, and Stew D. Baker are often seen out and about at community events. 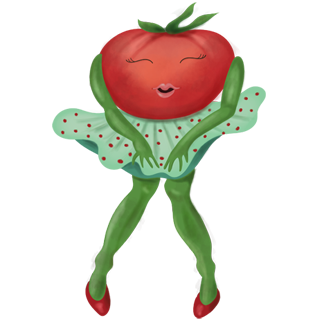 Who knows, maybe you’ll have the chance to dance along with your favorite dancing tomato on a future visit! Reminiscent of a bygone era, Stew D. Baker is one sweet vintage ride. Born in 1950, Stew rolls along the roadways, smoothly dancing through traffic, and waltzing his way into our imaginations. Oh, the stories Stew could tell! Perhaps he transported fresh tomatoes from local fields to the market place, cruised the strip on Friday nights, or carried the family home for Sunday supper. One day, Stew showed up in the Dancing Tomato Caffé parking lot. You might say he was looking for a new home. He has been part of the DTC family ever since. 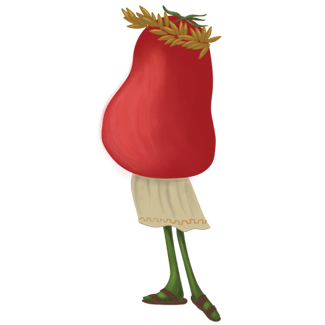 Stew happily attends local strolls, festivals, farmers markets, and other community events with his main squeeze, DTC’s very own sweet Cherry Tomato. 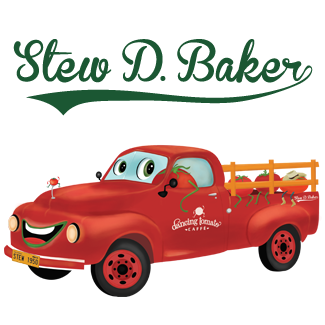 Stew keeps his engine running with a Certified Angus Beef® Classic Cheeseburger meal or a heaping helping of Fettucine Alfredo. 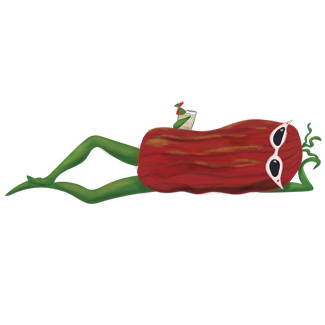 Our resident mascot, Cherry Tomato is a saucy girl. Since she was a seedling, Cherry cultivated friendships with everyone she met. With salsa in her veins and a swing in her step, Cherry’s presence brightens any occasion. Lovin’ life on the lighter side, Cherry revs up her appetite with the Antipasto Plate. 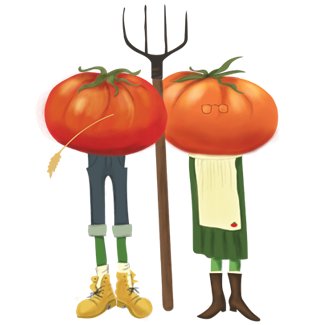 At the end of a long day on the farm, Mr. and Mrs. Heirloom Organic trade in their work clothes for a more sophisticated look. 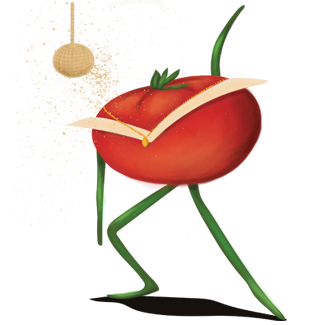 These cultured classics take to the Pomodoro Promenade where they boogie woogie with the best of them. Eggplant Parmesan Ciabatta is their classic go-to dish. 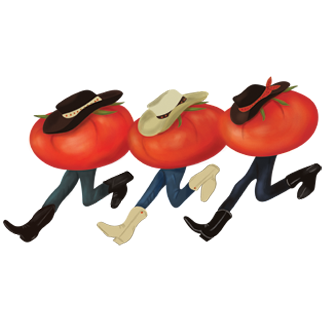 These three cowboys can’t get enough of the Tuscan Two-Step. After a long night of whirling their way across the dance floor, they start the morning off right with a Cowboy Breakfast Plate and a Cup of Joe, strong and hot, just the way they like it. Paula Nesian is a home-grown girl with an island flair. She spins and she sways, and when the music stops, she is always ready to dive into a Big Kamanawana Spicy Hawaiian Pizza, seasoned to perfection and baked with aloha in the oven. Mari Nara is one hot Roma tomato. She has a simmerin’ good time with her home-grown besties Basil, Oregano, and Parsley. They can often be found stirring up the stew pot and mixing it up with a heaping plate of pasta. 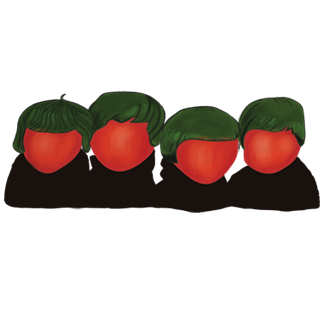 The Tometles: Getting by with a little help from their friends, Giovanni, Paulo, Giorgio, and Ringo stop by the caffé now and then. These chaps love to do the hippy hippy shake and reminisce about yesterday. Classics themselves, they have a real love for Lasagna Classic eight days a week. That’s one hit that always makes them twist and shout. Bruno Beefsteak has been living la vida low-carb and really lovin’ the results. 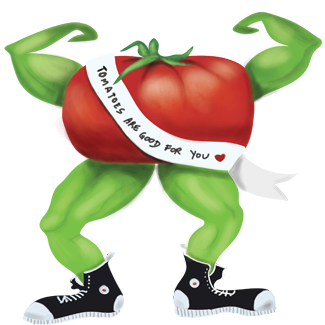 Recently crowned the King of Lycopene, this iron-pumping hunka love knows that his vast stores of vitamin C only serve to boost the absorption of iron. The Steak Merlot really makes Bruno strut his stuff. Don’t let her casual appearance fool you, Rosie Roma has an intense, brooding personality, and she really knows how to jazz up an evening. This sun-dried beauty queen exudes a smoky, sensuous essence when she shimmies across the dance floor. Rosie Roma loves to get sauced with the mushrooms and hang out with a flavorful Steak Balsamico. 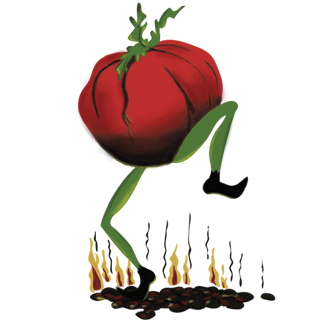 The Tomatonator is one celebrity with a variety of special interests. This big boy keeps an eye out for the freshest dish on the menu. He always picks the daily special and washes it down with a full-bodied Craft Beer. 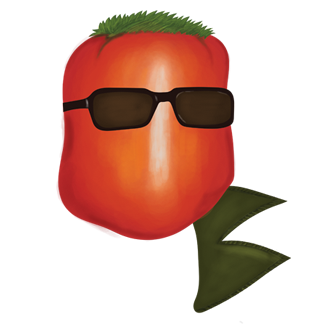 No matter what he orders, The Tomatonator is sure to be back for more. 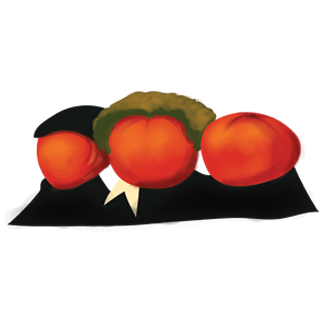 The Three Stewed Tomatoes are a crew of cut ups, cavorting about in their own slapstick style. Creating chaos wherever they go, this trio makes creative use of Zucchini Spears, Gourmet Onion Rings and slices of Homemade Pie. Dinner with the Three Stewed Tomatoes is ‘soitenly’ a memorable affair. Confident and smooth, Disco D’Angelo is one macho man who lives down at the YMCA and hangs out at the bus stop. Whenever he feels a Saturday Night Fever coming on, D’Angelo hustles on over to the Brick Wall Bar for a tall, cool drink. A Classy Cosmopolitan lends just the right touch of sophistication to this retro dude. Fabulous Fabio is hot to trot. Always on the lookout for fire-roasted fun times, this hot-blooded big boy pulses to the Latin beat of the Mambo. He’s light on his feet and down with the beat, and Fabio's favorite Pasta Ka-BOOM is such fun to eat! Invite your taste buds to the dance party! 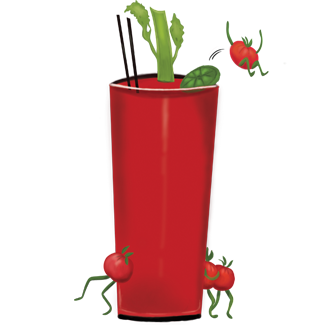 Packed with spice, produce, and vodka; our classic tomato cocktail is almost a meal in itself.